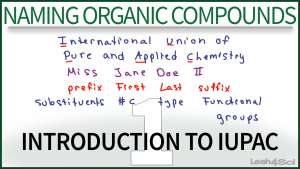 This is Video 1 in the Naming Organic Compounds Video Series. Click HERE for the entire series. Have a look around! There are lots of videos, guides, and cheat sheets. Thank you… A great help.. A pharmacy student..
My pleasure! Let me know if there’s anything else I can help you with. I am a fresh student of M.Sc Chemistry, and i found difficulty in nomenclature of multifunctional compounds. By cosulting your lectures i am able to solve my problems regarding nomenclature. It’s too much helpful. Thanks alot…..
You’re very welcome! I’m glad to help! you made my test a great deal for me ………….. Thank you so much for your videos. I was struggling so much with organic that I had to drop the class. I got an A on my first exam after watching your videos. Thank you a ton. That’s wonderful, Celeste!! I’m very happy to hear that! Glad I was able to help. How was your exam? Great video, thank you Leah! Thank you so much,i have my boards two days later.And i finally found your interesting videos and i am out of tension now!! I am grateful to God for you. You such a genius your presentation is so exceptional. How I which you was my orgo instructor. My orgo instructor teaches too fast.and saddenly I have been totally memorizing. I really want to learn the basic concepts of orgo. You saved me. I am preparing for jee. Thank you so much Leah! I have a test in 2 days. I haven’t prepared, but you are a savior! greetings from Turkey! You are an angel Leah!!! My proffesor is a really bad at teaching, she is just sitting and reading slides with a bad accent. I have not known how I can succeed, but now I am praying for you! understood very well. You have a clear delivery to help learn. Thanks a lot about these lectures, that are very useful for us, you’re very clearly, and you make chem so easy! !